So What If Jesus Was A Married Man? Mary Magdalene is said to be the bearer of the Holy Grail. In old French the word sangraal was commonly accepted to mean the Holy Grail. But when the word is split in two again in old French it means royal blood. When tradition states that Mary Magdalene took the Holy Grail with her to France in A.D. 42 some claim that it actually meant she took the royal blood with her. Another line of interpretation was that Jesus and Mary Magdalene married and that the union of two royal bloodlines – Jesus from the house of King David and Mary Magdalene from the royal House of Benjamin. The political fallout of this union could have resulted in the crucifixion of Jesus. The coming together of these two royal bloodlines could have given the oppressed Jews of that time new hope of a Jewish uprising and the reestablishment of Jewish kings. The story of this union of royal bloodlines does not end there. According to some the story continues in the town of Les Saintes-Maries-de-la-Mer, France. In this town, in the Shrine of Sainte Sara la Kali, between May 23 – 25 is celebrated the feast of St. Sarah also known as La Sara Kali. It is said that that in A.D. 42 Mary Magdalene arrived there with a 12 year old dark complexioned daughter Sarah. This child Sarah – which in Hebrew means princess – is said to be the daughter born to Jesus and Mary Magdalene. Joseph of Arimathea was said to be the protector of the Sangraal which was interpreted by some as the womb of Mary Magdalene. According to some accounts it appears that in A.D. 679, the Roman Catholic Church joined forces with the Carolingian dynasty to assassinate and remove the Merovingian King Dagobert. Not everyone agrees with the Sarah stories. There are claims that this account about Sarah is nothing but a “pious tale”. Was Jesus In Britain During The Missing Years? There is no mention in the Bible about what happened to Jesus during the missing years. Did Jesus spend these missing years in Britain? CC Dobson author of the book “Did Our Lord Visit Britain” thinks so. Dobson says that as a boy Jesus went to Glastonbury with Joseph of Arimathea on one of his business voyages. Dobson also claims that Jesus later returned there to study, pray and meditate. He says that Jesus built himself a small house of mud and wattles there. Tradition also has it that in a letter to Pope Gregory St. Augustine states that these was a church constructed either by the hand of Jesus or by divine labor or by the hands of Jesus himself for the salvation of mankind. The following is also shown as evidence for Jesus having spent his youth in England by the historian Gildas. He said Jesus’ “Light and precepts” were “afforded…to this island during the …last year of the reign of Tiberius”. Tiberius retired in A.D 27 to Caprae. In his writings William of Malmesbury included the contents of a letter given by King Ina to Glastonbury in A.D 700. The letter states “To the ancient church, situate in the place called Glastonbury (which Church the Great High Priest and Chiefest Minister formerly through His own ministry, and that of angels…..” This supports Gildas’ claim that Jesus had a ministry in Glastonbury. Legends of Jesus’ travel to Britain are also mentioned in the Arthurian legends. William Blake’s early 19th century poem “And did those feet in ancient time” was motivated by stories of Jesus’ travel to Britain. The Chalice Well in Glastonbury Tor is cited as proof of Joseph of Arimathea”s visit to Britain. What Happened To The Patriarch Of The Family Of Jesus? From the moment Jesus mentions his heavenly father all mention of his earthly father Joseph of Nazareth ceases. Several reasons are cited for this. One reason is that by the time Jesus became an adult Joseph had died. We know for certain that the only member of the family of Jesus who followed him to Jerusalem was James the brother of Jesus. The others of the family of Jesus may have joined him later. But we are not sure. According to the apocryphal “Story of Joseph the Carpenter”, the patriarch of the family of Jesus was a hundred and eleven years when he died, on 20 July 18 or 19 CE. But according to St. Epiphanius, Joseph was ninety years old when he died and was “buried in the Valley of Josaphat.” However, considering extra-biblical sources it would appear that Joseph died before Jesus began his adult ministry and was buried in Nazareth. This theory seemed the most plausible considering the closeness between Jesus and James. Because of his advanced age and the majority of his family in Nazareth Joseph continued to stay there where he died and was buried. Others believe that he had gone to the feast of the Pasch to pray at the Temple where he died and was buried in Josaphat in the tomb of his ancestors. Who Really Made Up The Holy Family Of Jesus? Was This The Family Of Jesus? Was the family of Jesus just him, Mary and Joseph? Or was the holy family of Jesus made up of more than just this three? Did Jesus have six brothers and sisters? (Fig 1) Jesus in the house of his parents? According to some accounts the six referred to in the New Testament as the brothers and sisters of Jesus were in fact his step brothers and sisters. There are claims that when Joseph was forty years, he married a woman named Melcha or Escha. Other sources name this woman Salome. In any case it is said that they were married for forty nine years and that the couple had six children – two girls and four boys. According to some sources the names of the six siblings were Justus, Simon, Judas and James and Assia and Lydia. And according to some accounts James was the youngest of the four boys. Others claim that James was the eldest of the boys since he is almost always mentioned first in the list. However even Matthew and Mark do not agree on the order in which the boys were born. Matthew (Matthew 13.54–56) lists them as “James and Joseph and Simon and Judas”, whereas Mark (Mark 6.3) lists them as “James and Joses [a variant of Joseph] and Judas and Simon”. So did the family of Jesus comprise of nine rather than the three popularly referred to as the Holy Family of Jesus Christ? The other controversy relating to the family of Jesus is: was James the eldest or the youngest of the siblings? Both the Evangelists who list the siblings mention James making him the eldest. If the six so called brothers and sisters were indeed the step siblings of Jesus, it is likely that James was the eldest and elder to Jesus. But if they were the blood brothers and sisters of Jesus then while James could still be the eldest of the six siblings he would be younger than Jesus. The answer to this and other questions will depend on Mary’s place in the Family of Jesus. Crucifixion of Jesus – Who was responsible? This is a question crime investigators invariably ask. We know that the crucifixion of Jesus was a crime. Who was responsible for the crucifixion of Jesus? Evidently the one who benefitted the most. Was it Judas Iscariot who was responsible for the death of Jesus? Judas Iscariot was one of the twelve disciples of Jesus. He is notorious for having betrayed Jesus for a bribe of “thirty pieces of silver” with a kiss – the Kiss of Judas – to the soldiers of the High Priest Caiaphas. Was thirty pieces of silver a great deal of money? Probably not. According to Matthew 27:3-10, Judas returned the money to the priests who used it to buy a potter’s field. Judas himself is said to have committed suicide. According to the Acts of the Apostles Judas used the money to buy a field but is said to have fallen head first and died. This field is known as Akeldama or Field of Blood. The betrayal by Judas, the most controversial person in the New Testament is said to be the fulfillment of a prophecy. Tradition has it that Judas committed suicide by hanging himself. Was it Pontius Pilate who was responsible for the death of Jesus? Pontius Pilate who was the Roman prefect (governor) of Judea, a sub-province of Syria, was the one who presided over the trial of Jesus. As prefect, Pilate had several responsibilities. He was the head of the Roman military legions. He was the one who sanctioned construction works and controlled the collection of imperial taxes. He also passed judgment in civil and criminal cases. During his ten-year tenure as prefect, Pilate had several disagreements with his Jewish subjects. According to Jewish historian Josephus is said to have annoyed the Jews on several occasions. It was thought that he would do the same during the trial of Jesus. The Jews protested against Pilate several times. Not only did Pilate not have adequate concern for Jewish sentiments he was also said to be cruel and corrupt. Pilate spent most of his time in the coastal town of Caesarea, however he came to Jerusalem for significant Jewish festivals. According to the followers of Jesus, Pilate did not play a crucial role in the trial of Jesus. He was not the one that decided that Jesus should be given the death penalty by crucifixion. Although Pilate eventually decided that Jesus should be crucified, that decision was reluctant and under duress. Some scholars say that early Christians down-played the role of Pilate in the trial and execution of Jesus in order not to alienate Roman audiences. It must be noted that Jesus was given the most horrible punishment possible even though the Roman prefect had a choice of options such as flogging, handing the matter back to the Sanhedrin, or to refer the case to Herod Antipas, ruler of Galilee. Some have interpreted this to mean that Jesus was blaming the Jews as a whole. However, it is clear that Jesus blamed the chief priest as he referred “to a singular person as “he” or “the one” who was responsible”. Tradition has it that Pilate who was known to be corrupt took a hefty bribe from Joseph of Arimathea and conspired to ensure that Jesus did not die on the cross. Pilate was also reluctant to condemn Jesus to death because his wife Claudia Procula interceded on behalf of Jesus. Pilate eventually relented and condemned Jesus to death because he feared a Jewish backlash. Was it Caiaphas who was responsible for the crucifixion of Jesus? Joseph Caiaphas was the Jewish high priest who is said to have organized the plot to kill Jesus. Caiaphas is also said to have headed the Sanhedrin trial of Jesus as the then high priest. According to the most accounts, Caiaphas was the major antagonist of Jesus. Caiaphas had many important responsibilities, including control of the Temple treasury, managing the Temple police and other personnel and performing religious rituals. Probably the most important role of Caiaphas was to be the liaison between the Roman rulers and the Jewish people. The Romans expected him to keep the Jewish populace under control. Caiaphas and his family enjoyed power and many luxuries as long as he was in the good books of the Romans. He feared that all these perquisites would be lost if there was a Jewish uprising. Caiaphas reasoned that it is better for one man to die –Jesus Christ – rather than many lives be lost as a consequence of Jewish unrest and the Roman reaction to the unrest. The Second Vatican Council (1962–1965) of the Roman Catholic Church under Pope Paul VI “repudiated belief in collective Jewish guilt for the crucifixion of Jesus.” It declared that “the charge can be made neither “against all the Jews, without distinction, then alive, nor against the Jews of today”. To answer the question “Cui Bono”, it was without doubt Joseph Caiaphas and a few other Jewish leaders who stood to gain the most from the crucifixion of Jesus. Crucifixion Of Jesus – What Happened To The Nails? Crucifixion Of Jesus – Are These The Holy Nails? According to the Catholic Encyclopedia around 30 nails have been venerated as nails used in the crucifixion of Jesus. However others believe that only 3 or 4 nails were used to crucify Jesus. Legend has it that Constantine’s mother gave her son a portion of the crucifixion nails. A few of these nails were said to have been embedded in his helmet and the bridle of his horse to protect him from harm. . This is one account regarding the “Holy Nails” from the crucifixion of Jesus. Simcha Jacobovici the host and producer of the Channel series “Secrets of Christianity” is said to have stumbled across something that amazed him. It seems that in 1990 an Israeli archeologists digging at a 2,000-year-old burial cave revealed two nails made by the Romans, but kept the discovery quiet. However the two ossuaries that were excavated from the burial cave were publicized. These ossuaries bore the inscriptions “Caiaphas” and “Joseph son of Caiaphas.” The second was an intricately decorated ossuary is now housed in the Israel Museum in Jerusalem after touring the world. We know from the Bible that Caiaphas was the high priest who was instrumental to the crucifixion of Jesus. Scholars seem to agree that the Caiaphas ossuary is of the high priest. As such the nails excavated from this tomb must be of greater significance than meets the eye. Popular opinion is that these nails are the nails used to crucify Jesus. At the request of Jacocovici, Israel Hershkovitz, a forensic anthropologist at Tel Aviv University located the nails initially thought to have been misplaced. Since the two nails were without the original packaging, Hershkovitz could not confirm if these were the two nails from the Caiaphas tomb. But he knew for certain that they came from the IAA (Israeli Antiquities Authority). Jacobovici compared these nails with an only specimen of a nail used in a crucifixion. The nails looked rather similar, except that they were slightly less in length. Karen King a professor at Harvard Divinity School announced in September 2013 professor announced the existence of a Coptic gospel text on a papyrus fragment that contained the words “Jesus said to them, ‘My wife . . .’ “. The Christian world was astounded. This meant that the Church would have to take another look at traditional beliefs because of this radical revelation. 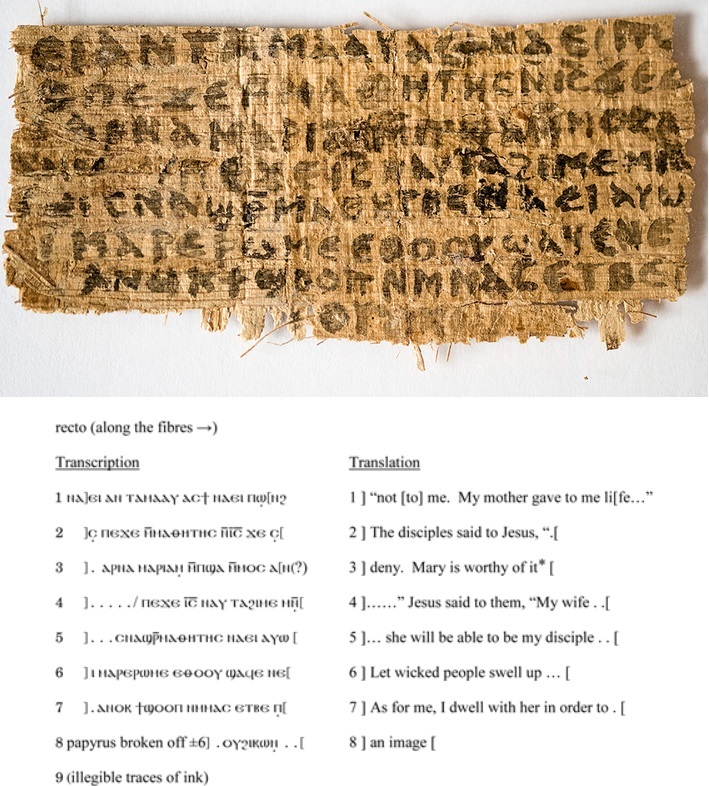 However shortly thereafter Christian Askeland—a Coptic specialist at Indiana Wesleyan University trashed the so called “Gospel of Jesus’ Wife” papyrus a fake. Others who studied the fragment criticized the fragment as “sloppily reworked from a 2002 online PDF of the Coptic Gospel of Thomas and even repeated a typographical error”. Nevertheless other scholars are convinced that the papyrus is a fake. But the issue is far from closed and the debate will perhaps go on inconclusively for a long time to come.